Project IGI 2 is based actually, like already the first part, on a flight simulation engine. This allows for gigantic, pretty levels under a huge sky, however, also interiors are passable and rather considerable. Only the enemies are not so pretty. 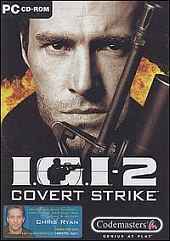 In IGI 2 you have to creep to some cover then you have to creep around some more. The levels are relatively straight-forward and do not use the possibilities given by the engine. While you couldn't save a game in the 1st game during a mission, this is now possible (3 times per level). You slip into the role of the British secret agent David Jones. Among the rest of the levels you play in the ice of the tundra and also in hot North African areas. The mission purposes are indicated about the laptop which is connected again with a satellite. There are about 20 missions where you roleplay through light and shadowy areas. With the help of a visibility meter you can estimate how well you are hidden from your opponents. The enemy AI is somewhat lacking and they will do stupid things but their aim is very good. There are also some bugs in the game and it doesn't look as nice as good as more higher profile recent games.